LIC AAO Admit Card 2016; Couple of months ago Life Insurance Corporation of India published a notification for for engagement of Assistant Administrative Officer (Generalist). ■ Exam Dates : 05, 06, 13th March 2016 (Tentative). As per Advertisement we knew that the Online Examination for Selection of AAO (Generalist) will be held in 05/03/2016 (Saturday), 06/03/2016 (Sunday) and 13/03/2016 (Sunday). The Admit Card for above mentioned Examination through Online Mode will be available in the Last Week of February 2016. The minimum marks to be obtained in each Section and in the aggregate shall be decided by LIC. English Language test is of qualifying nature and the marks in English Language will not be counted for ranking. The decision of LIC in this regard shall be final and binding on the candidates. No correspondence will be entertained in this regard. The corrected scores obtained by each of the candidates in different sessions (if held) will be normalized using equi -percentile equating method. The Corrected Scores so obtained by a candidate are made equivalent to take care of the minor difference in difficulty level, if any, in each of the objective tests held in different sessions to arrive at the Equated Scores* * Scores obtained by candidates on any test are equated to the base form by considering the distribution of scores of all the forms. Appearing in the online examination or mere pass in the online examination shall not vest any right in a candidate to be called for Personal Interview. 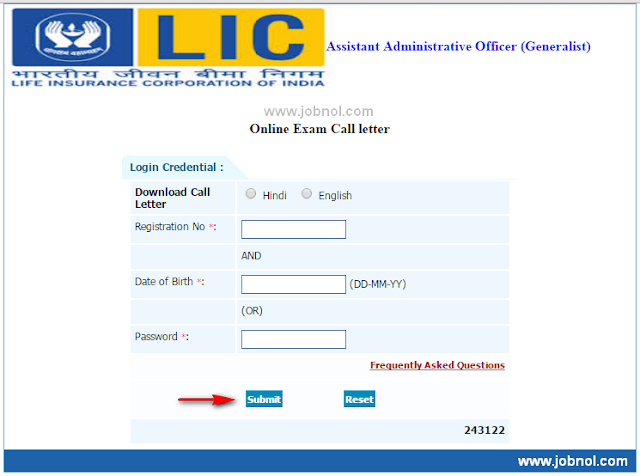 How to Download Admit Card of LIC AAO ? You should visit the link for downloading admit card and provide the credentials like Registration Id and Password. After providing the the Login Info Click Submit to get the Admit Card/Call Letter for Online Examination. You can save the the Admit Card in PDF file for further need. Admit Downloading Link has been activated by LIC, You can now download Admit Card. See Image Below for Detailed Information. If you have any feed back do comment below. Thank you..! 0 Comment to " LIC AAO (Generalist) Admit Card for Online Exam 2016 - www.licindia.in "